A variable voltage D. C. source is required for the Electrodeposition process of electroplating, anodizing etc. The various ratings of voltages and currents required for the process depends upon the metal to be deposited and the process adopted. VOLTAMP Rectifiers are designed in standard voltages of 8 V to 24 V, and in current ratings varying from 100 Amps up to 10000 Amps. A. C. INPUT : Rectifiers are designed to work on 415 V AC 3 ph. 50 Hz. supply and suitable for an input range of 375 V to 450 V. Units of very small capacities namely 8 V/12 V/16 V DC up to 100 Amps ratings can also be supplied to work on an input voltage of 240 V AC 1 ph. 50Hz. supply. The DC output is continuously adjustable from zero to full rated value, from no load to full rated current, over the input range as described. All 3 phase units have low ripple of less than 5% and are suitable for all kinds of metal finishing. The units are assembled with high quality materials, and the components are manufactured to relevant specifications. The transformers are of class 'A' insulation and conform to IS 2026 in general. The laminations used are C.R.G.O Silicon steel, low loss type. The wound coils are impregnated with oven baked varnish. For high current units the transformers secondary is generally double wye. An I. P. T. wound with copper, is provided on its secondary, to extend the conduction period of windings and diodes. The Rectifier is assembled by using silicon diodes, mounted on heat sinks and connected in full wave circuits. Individual R.C. components are used for hole storage protection. The diode assembly is always selected to have at least 40% extra rating above the maximum output current. In order to facilitate voltage variation from zero onwards "VARIVOLT" variable auto transformers are used as independent units, or some times, accommodated in the transformer tank. Motorization is provided as an optional feature. he DC output is continuously adjustable from zero to full rated value, from no load to full rated current, over the input range as described. All 3 phase units have low ripple of less than 5% and are suitable for all kinds of metal finishing. MCB/MCCB protection is provided on the input and 3 fuses are provided on the output of the "VARIVOLT" variable auto transformer. 3 pilot indicators are incorporated on the incoming side. 96 sq voltmeter and ammeter with suitable shunts are provided to read the output voltage and currents. Remote switching-on by using contactors and bimetal over load relays. Push button operation by motorization of the "VARIVOLT" variable auto transformer. 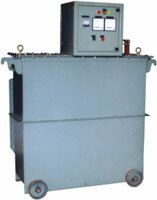 "VARIVOLT" auto transformer with zero start facility. Timers, time totalizers, ampere hour meters, etc.